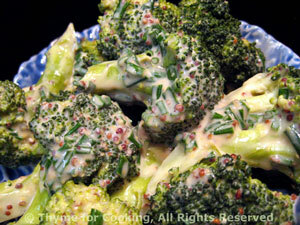 Broccoli with Yogurt and Mustard, easy vegetable recipes. Put in steamer basket in saucepan with an inch of water in bottom. Put on medium heat and steam for 10 minutes or until just done but still green. Remove from pan and put into a small baking dish. In a bowl mix yogurt, mustard and oregano. Sprinkle with cheese and bake, 400F (200C) until cheese has melted, about 10 minutes.